Today is the final day to sign up for our Summer Blessing Giveaway, be sure to enter! Click HERE. Wednesday morning of last week I woke up and checked Facebook. The first post in my newsfeed was an update that dear Wynter Pitts, author of She Is Yours and God's Girl Says Yes, unexpectedly passed away the night before of a massive heart attack. It hit me hard. Wynter's family, Dr. Tony Evans and family, is very dear to my heart for each of their ministries and how they live their lives. Coming from an extremely close family myself, I can't fathom the pain this extremely close family is facing. I was on launch teams with Wynter for her books which helped me to get to know her and be a small part of her amazing ministry. She was a wife in a loving marriage. She was the mother of four young girls. She was 38 years old. I spent the next 48 hours in an emotional state. It hurt. Knowing her family, especially her young girls, were grieving and hurting breaks my heart into a million pieces. Knowing she was only 38 years old, my very age, and was seemingly healthy scared me. I kept checking social media. I wanted to know how her family was doing. I kept praying. I wanted God to hold them close. Six months ago my family unexpectedly lost my mother-in-law. Losing someone hurts so badly. I know this, I am still in the grieving process. When you don't get those moments to say goodbye, it leaves not only a void, but a feeling of things being incomplete. I've spent the past few days thinking over Wynter's ministry and legacy. I want to share five things I've learned from this precious woman. Wynter lived intentionally. When she couldn't find Biblical resources for her daughters, she started a ministry on her own. She was committed to teaching her girls to live for God. When she was with her family, she was with her family. We need to live with intention. Wynter loved her daughters, but she knew she had to turn them over to God. Her book She Is Yours, co-written with her husband Jonathan, taught us that while our children are ours to raise and teach, they are God's first. We must turn them over fully to God. 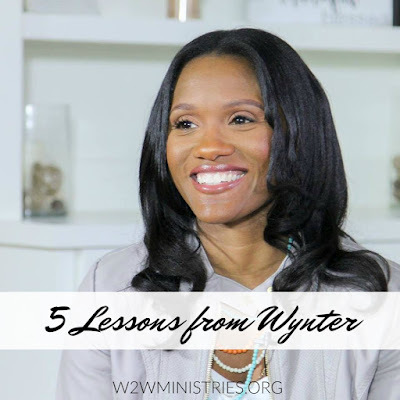 At the beginning of motherhood, Wynter struggled. She says, "I cannot recall an exact moment, but thankfully something changed! Not my situation but my perspective." We need to change our perspectives and see things like Jesus does. During the going home service, Wynter's cousin, Chrystal Evans Hurst, shared that Wynter often said, "I am going to pray about it." Everything she was faced with, big or small, she took it to God in prayer. We need to being praying more. 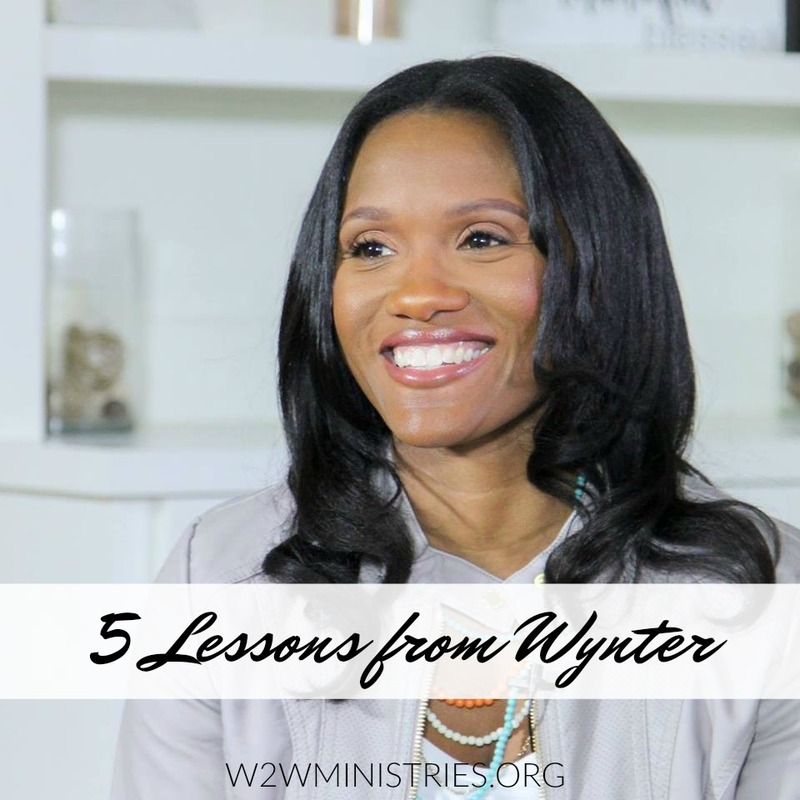 Wynter often shared that when God asked her to do something, she said yes. Would it be hard? Maybe. Does it sound crazy? Possibly. But God honors obedience. We need to be yes girls. Wynter lived a beautiful life and left an incredible legacy. Let's take these five lessons and live them out. Wednesday evening, only 24 hours after losing Wynter, The Evans family shared openly at their church about faith and loss. If you are hurting, afraid, unsure, angry, this video is for you. It is lengthy, but well worth the time. I simply cannot fathom how this amazing family is going with this loss! Beautiful lessons learned from this very unfortunate situation. I pray for this family!